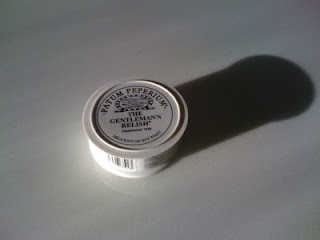 While growing up in England, we always had a pot of Patum Peperium The Gentleman's Relish in the refrigerator. It always seemed so grown up to me and I did not try it until recently. I ate biscuits (or cookies in the US) with tea when I came home from school, but now, I have become very fond of this anchovy paste spread on whole wheat toast. It is technically salted anchovies (60%), butter, salt, herbs, spices and tastes like salty anchovy butter. If you are into the savory and fishy, it's a must-try. Patum Peperium is available in New York at Myers of Keswick (634 Hudson Street). Fortnum & Mason also makes an anchovy paste called Fornum's Relish Anchovial Alchemy (an armada of superior anchovy). This is similar to Patum Peperium, but a little more peppery. I love the classic old style pots both these products are sold in. On a rainy Sunday afternoon with a hot cup of tea (with milk of course), anchovy paste on hot buttered toast is about as good as it gets.